Once you've tried this roasted tomato soup you'll agree that roasting the tomatoes first really does make all the difference. 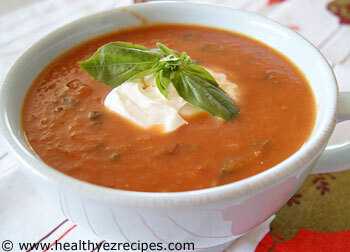 It just seems to add an extra depth of flavor to the soup that isn't present in other tomato soup recipes. Yes, you do have to set aside an hour and a half to roast the tomatoes, but once the tomatoes are cooked, making the soup is easy. 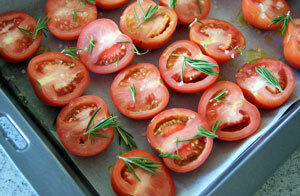 Cut tomatoes in half and arrange, cut side up, on a baking tray lined with parchment paper. This will prevent them sticking and make them easy to remove. Sprinkle with sea salt and the olive oil to bring out the flavors. I also sprinkled over some thyme leaves. Bake in the oven for 30 minutes. Take out of the oven and add the garlic cloves. There is no need to peel the garlic first. 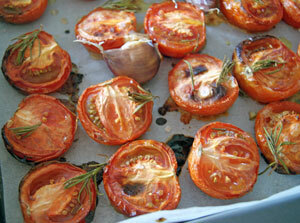 Return to the oven for a further 1 hour or until the edges of the tomatoes are blackened and the garlic is soft. Remove from the oven and discard the thyme leaves. They were there to add flavor to the tomatoes and have done their job. Gently squeeze the garlic cloves to push out the flesh, then discard the skins. 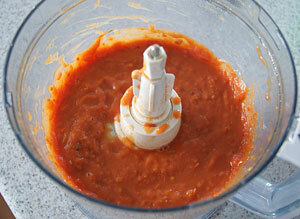 Peel the skin from the tomatoes and add the peeled tomatoes and garlic flesh to a food processor. Blitz everying together until a thick puree. 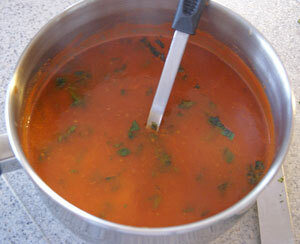 Place the tomato puree and water into a pan and bring to the boil. Then reduce the heat and simmer for 5 minutes, stirring occasionally. Stir in the basil and simmer for a further 5 minutes. Strain the soup if you wish or leave it chunky. Spoon into a serving bowl and top with low fat sour cream and extra basil leaves.